Using the power of the internet to tell your story, gain influence with your audience and promote your business, your blog is the fuel that powers your brand. But according to the NY Times, 95% of all blogs fail; and the reasons are many. Time, a shortage of good content, ‘it’s everyone’s job yet no one’s job’ are some of the reasons why blogs fail. 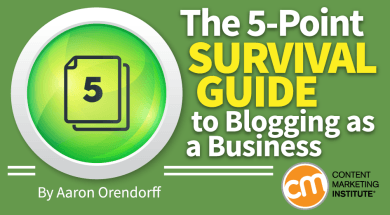 If you’re blogging now or getting ready to launch a new blog Aaron Orendorff‘s latest article published by the Content Marketing Institute, is a tremendous guide on how to be successful and how to get there. Aaron is a freelance content strategist and writer and he’s the owner of iconiContent; the title of his article is ‘The 5-Point Survival Guide to Blogging as a Business’ and it’s our featured article today on this episode of your ‘A Slice A Day’.